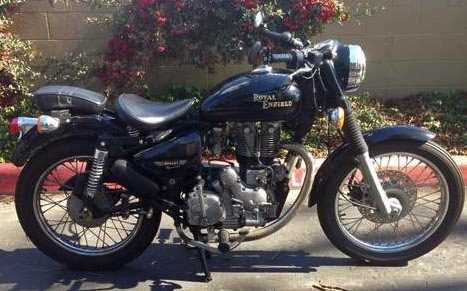 California life is just a dream for this 2007 Royal Enfield Bullet. Royal Enfield USA recently announced price cuts across the brand for new Royal Enfield motorcycles. The announcement included the very good news that the Manufacturer's Suggested Retail Price will be the same for all 50 states. Americans are familiar with the fact that motor vehicles sold here are often the same across all 49 states whose names are not spelled "C-A-L-I-F-O-R-N-I-A." California sets higher standards for emissions that require costly extra equipment and testing, the price of which most manufacturers are happy to pass along to customers. Royal Enfield is now the exception. After the end of Royal Enfield production in the UK in 1970, official imports of Royal Enfields — now from India — to the 49 United States didn't resume until 1995. California, with its tougher restrictions, didn't get new Royal Enfields at all until 2011. New Royal Enfields that meet California requirements can be spotted by the small black box and tubing that provides extra emissions control on the front down tube. There now are dealers across California to sell you one of these new motorcycles. But what if a California resident wants an older, used Royal Enfield, without the added emission controls? California likely won't register it for you unless it really is used: the figure usually cited is 7,500 miles. "1. Took the bike to California Highway Patrol to have the bike verified because the bike was sold to me with a title from the state of Utah. CHP told me that because the bike is out of state and has less then 7,000 miles on it that it can't be approved to be ridden in the state of California. "2. CHP also says that the year and make of this bike doesn't meet California emission standards to be ridden in California. "So all that hard work, time, and energy only to find out it can't be approved to be ridden in California. None the less, I'm trying to sell this gem of a bike to somebody who is looking out of state or somebody in state who thinks they can make it California approved." The California Department of Motor Vehicles website ominously entitles its explanation of this "The Bottom Line." "If you are a California resident and acquire a new car, truck, or motorcycle from another state, it must be certified to meet California smog laws to be registered in California... California considers any vehicle with less than 7,500 miles on the odometer at the time of purchase or trade by a California resident or business, to be a new vehicle. This is true whether or not the vehicle has been registered in another state... If you are moving to California from another state, you may register a new 49-state vehicle if it was first registered by you in your home state, or for military personnel, in the last state of your military service. When applying for vehicle registration in California, you must provide evidence that the vehicle was registered... No motorcycle or diesel-powered vehicle can be converted to California emission standards." Apparently, if you have an older Royal Enfield registered to you in another state and move to California, you can bring it with you and have it registered. But if you already are a California resident, either buy a California compliant Royal Enfield, or check the mileage on the motorcycle you're buying. All this applies to officially imported Royal Enfields, the ones with VIN number and emissions tags where they belong. Private imports from India may have a harder time still. 1. "in the day" several out of state Enfield dealers would supply their Ca customers with a "loaner" speedo showing above 7,000 miles. 3. I see ads on EBay all the time that state "odometer mileage may not reflect actual vehicle mileage"
I'd say that there's hope for our friend in Long Beach..but it'd have been far better if he'd discovered the 7,000 mile rule before contacting the CHP. ""2. CHP also says that the year and make of this bike doesn't meet California emission standards to be ridden in California." Troubling,to be sure, but true of ANY other 49state vehicle as well. One last thought: for a CA sale bike the bike you show from Manitowoc, WI is particularly attractive.. because it'd have the 7,000 miles once it'd been ridden across the CA line :-) Buyer should read "Zen& the Art of Motorcycle Maintenance" on the flight to WI….